To run the game, you must first run the interpreter - by double-clicking on the file Liscript.jar in the root folder of the archive (next to this readme file). The interpreter window opens, which imho is interesting and by itself, when opened, the standard language library (standard_library.liscript file) automatically loads into it. To start the game, click the leftmost button in the load file and select the Labyrinth.liscript file in the Demo folder. 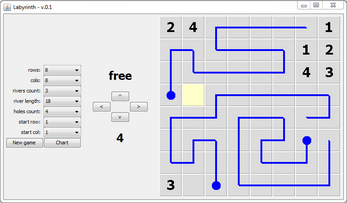 Before starting the game, select the field parameters and your starting position and click the New game button. 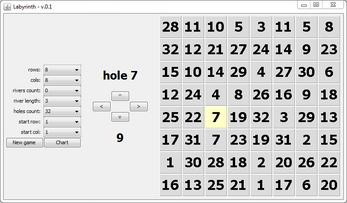 The program will generate a field (if the start data is correct) and the progress buttons will be available. During the game, the player moves through an unknown field, by moving up / down / left / right. 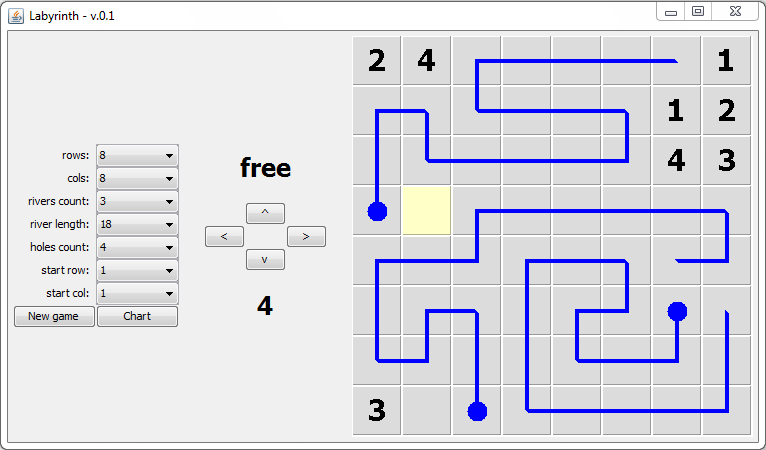 After each turn the program informs the player of the result of his turn - if he hits the pit The player moves to the corresponding dual cell of this pit, when it hits the river - to the end of the river, with an empty field - to this cage, while moving into the wall - remains in place. The pits are reported with indication of their numbers, the river - without indication. The rivers flow strictly through neighboring cells (not diagonally). Only one object can be in one cell of the field. It is guaranteed that any field generated by the program is passable - that is, from any cell it is possible to get into any other (except, perhaps, not the final cells of the rivers). With certain field parameters, the program may not generate a passable field from the first time (for a limited number of attempts), in which case "oops! Try again" is issued. You can restart the field generation or select other parameters. Try to start with simple fields - size 3 * 3, one river length 3 and one or two holes. We play in this field in the mind with my 9-year-old older son during the walks :) Gradually go to more complex fields - for example, 5 * 5 with 2 rivers 5 and 3-4 in length. Etc. 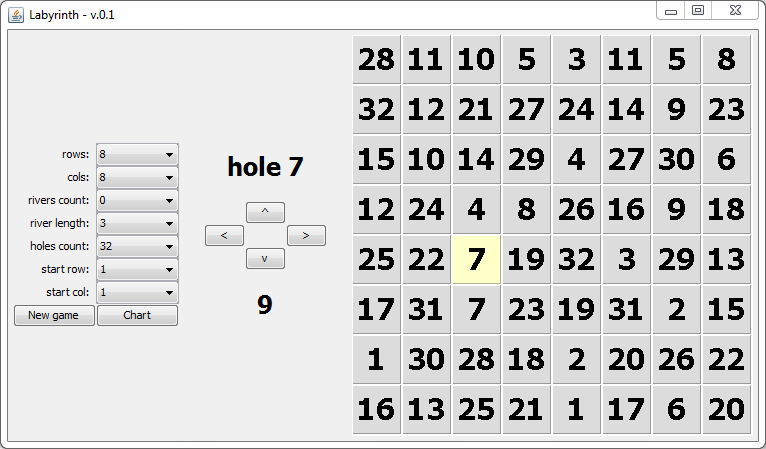 set by other missions - for example, generate a field 8 * 8 with 4 rivers length 13 and 5 holes (if it does not generate the first time, do not hesitate to repeat the generation) or 8 * 8 without rivers and with 32 holes :), open the map by the Chart button and seeing it, try to hit any given cells in the least number of moves. Imho is also fascinating. Or you can come up with other tasks and missions that your imagination will allow. PS: all source codes are distributed on free-use terms.